Here at telecomhall we share with you powerful, fast and easy to run parsers that can process all raw CM dumps* you may have. (*CM - Configuration Management files with configuration parameters of your entire network). Hunter Boda parsers are written in Java and distributed as “.jar” files. The easiest way to run a jar file in Windows is to use the command prompt. (Tip: to run the command prompt, look for “cmd.exe”). The parsers can be used on other platforms that have Java installed besides Windows. This write-up focuses on Windows as it is the currently supported platform for the Hunter tools. Important: Make sure you run the command on one line only (NOT on separate lines). One of the best ways to learn is by example, so let’s see the Boda parsers in action with examples for Ericsson 3G (please note that exactly the same procedure applies to other Technologies (2G/3G/4G) or Vendor (Huawei, Nokia, Ericsson, and ZTE). You’ll see how fast and easy it is to process your dumps. If you the followed the Hunter recommended folder structure, you will have the Boda parser (.jar file) in the Scripts Folder but you can place it in any other folder you prefer. At this point, your work is almost done! Now, you have 2 options (always remember that the command is run on ONE LINE only - NOT on separate lines!). I am emphasizing this because the command appears to be on multiple lines in this example. This is due to the limited sentence width. How to run the parser to process ONE file. How to run the parser to process ALL files in a folder. That’s it. 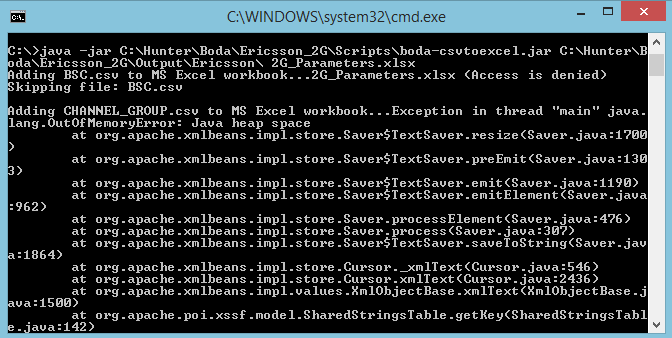 You will find several csv files (Text files that can be opened with Microsof Excel ). The generated csv files have extra IDENTIFY fields, with very useful information like ‘Filename’ (for the name of the raw dump file processed) and ‘varDateTime’ (for the date and time the dump was taken). If you are reading this for the first time, you’ll be surprised with the results. And if you are already a Hunter user - and use the Boda parsers - you probably already know the power those tools give you. Either way, your feedback, and suggestions are valuable to us. This is mainly because we want to expand the solutions to other domains (like PM - Performance Mangement and FM - Faulty Management) and other types of Analysis (Geo Mapping, Charting, etc) and eventually fully a functioning SON solution around this. Your participation in the forum is certainly the most important part for this roadmap. Besides the tools, we also want to develop and establish best practices and analyses. This we cannot do alone. So, feel free to post your comments in the forum, add new topics, invite your friends to join and to share whatever may be useful for the community. Great work!!! and Thanks for sharing these powerful tools. Thanks for such initiative , one note for parser output , is their in roadmap also combine all CSV in one Excel with multiple sheet whenever search for parameter will be to find rathar than open CSVs. la command Java fonctionne correctement mais pas d’Output CSV. We did not want to convert the dump files directly into an Excel document because there is more flexibility for the users in what they could do with the parsed output if it is CSV format. Nevertheless, we have put something together that can help combine the CSV files into an Excel workbook. Sit back and wait for the process to complete. Below are screenshots of how to run the tool and the expected output. Thank you dear for your help . If you have more than 4G RAM on your laptop, you can increase the Java heap size to 2G (-Xms2048m ). @CSilva, I will test this over the weekend and release a new version. Thanks for the feedback. Hi Emmanuel, for Ericsson, the newer SRAN OSS uses an xml format for 2G parameters too and doesn’t need the CNAIv2 export. Do you have a view on this and if and when you are planning to develop the same? Thanks for sharing this in here. You are running a great forum, keep up this good work. Many thanks. Its really helpful. This is the first time I use this tool, and I got this error in CMD, can I know what is the problem?